As many other RadControls, RadCheckedDropDownList can also be used as editor in RadGridView. This article will show you how to achieve the following result. 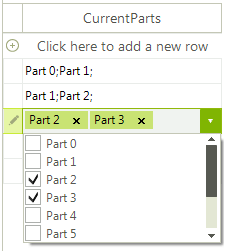 The "MyPart" class contains a singe public property named "CurrentParts" and a constructor that sets this property. 2. The next step is to replace the default editor. This can be achieved by handling the EditorReqired event. This is the place where the data source should be set as well. 3. The final step is creating the editor. This can be achieved by creating a descendant of RadCheckedDropDownListElement and overriding its Value property.